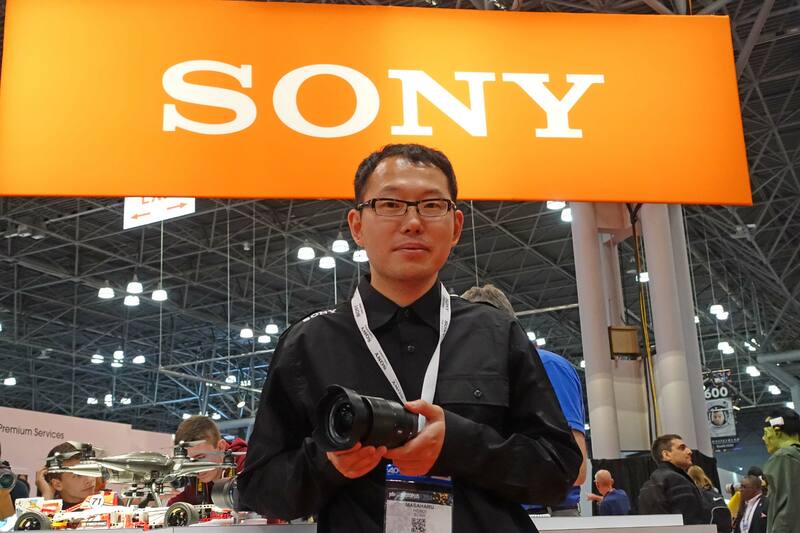 Meet Masahiro Hosoi, Sony Designer of the 28-135mm f/4 Full Frame (24x36mm) Zoom Lens. It could be what you would call “disruptive technology.” How can a 35mm cine zoom have a suggested price of a mere $2,500 when it ships in December? Admittedly, it comes in Sony E-mount only (18mm flange focal depth.) It will be the “kit lens” for the new Super35mm format Sony FS-7 digital camera, and is already a darling of the full-frame (24x35mm) A7S world. Focus can be switched from auto to manual by sliding the focus ring forward or back. A linear autofocus motor is extremely quiet–no gears to make noise. SSM (Super Sonic wave Motors) are used for quiet zooms and iris control. The 28-135 uses double aspherics — aspheric surfaces on both sides of a lens element. Juan Martinez and Tatsuro Kurachi dream of lenses. Could they be dreaming of the next model–perhaps one that covers 18-100 mm? 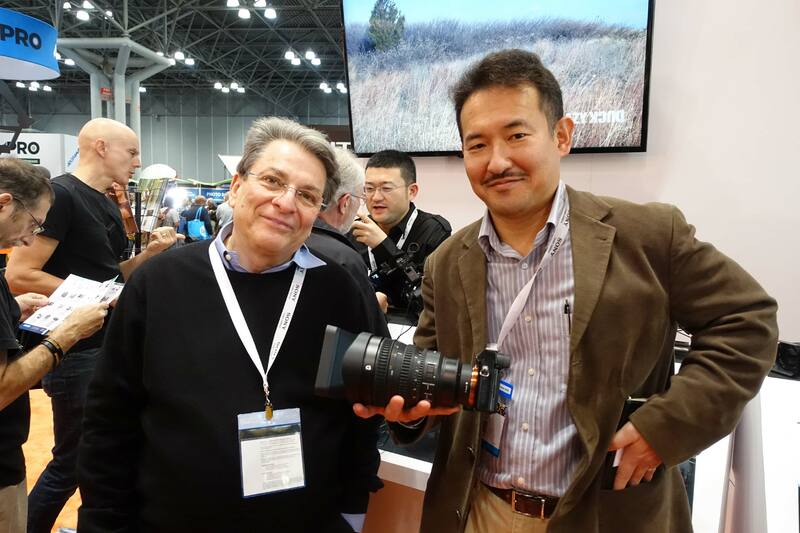 28-135 on Sony A7s: Juan Martinez, Sony Senior Product Manager, and Tatsuro Kurachi, Director of Product Marketing and Management. 28-135 FF 24×36 lens? It will be kitted for Super 35 cams?. Super 35 is not 24×36. Looks like it means a lens with 28-135 FF FOV for Super 35. Correct. The Sony 28-135mm covers Full Frame Still (aka Leica Format) 24×36 mm. Just like ZEISS Compact Zooms and Primes, and Schneider FF Xenons, Canon, Nikon, etc. When you put the 28-135 on a Super35 mm format camera–which has an 18×24 (4:3) or 15×24 (16:9) aperture, it is still a 28-135 mm lens. (Optical law: a 28 mm lens is always a 28 mm lens no matter what camera you put it on.) It’s just that there’s a bigger image circle.